The Middle East and North Africa (MENA) region is a volatile mix of religion, ancient civilizations, political turmoil, wealth and poverty, beauty, extremism, and violence. 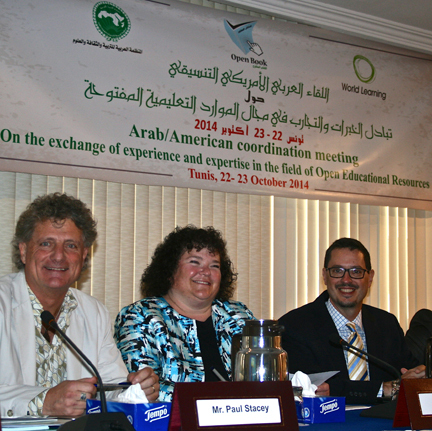 Can Open Educational Resources (OER) be a form of diplomacy and peace in this region? Can open education offer some small hope as an alternative form of engagement, action, and reform – instead of drones and beheadings? For the past year or so I’ve been helping the US State Department with their Open Book project. Announced by Hilary Clinton before she stepped down as Secretary of State the Open Book project is an initiative of the U.S. Department of State in partnership with the Arab League Educational, Cultural and Scientific Organization and leading education innovators to expand access to free, high-quality education materials in Arabic, with a focus on science and technology. Promoting and expanding access to these resources will help to create educational opportunity, further scientific learning, and foster economic growth. See Arab League, U.S. Launch Open Book Project for more. 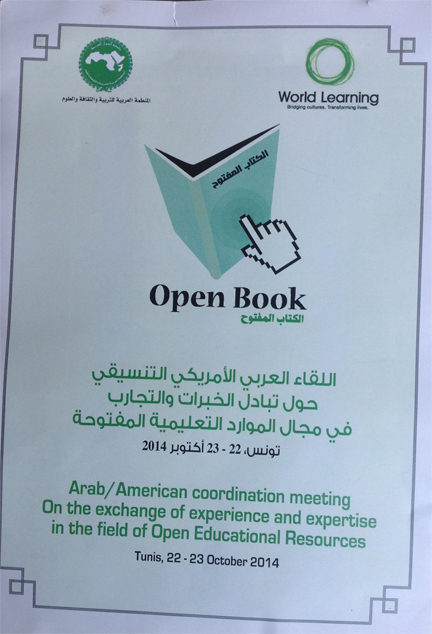 Evaluate the impact of OER on education business models and practices in MENA and the U.S.
With the support of World Learning and a team of OER experts (of which I was one) the Open Book Project was structured as a two phase exchange program. In Phase I education professionals from all countries in the Middle East and North Africa were invited to apply to participate in a US-based OER fellowship. Fourteen people from eleven countries including Egypt, Jordan, Lebanon, Morocco, Palestinian Territories, Yemen, Tunisia, Somalia, Sudan, Saudi Arabia and Qatar were selected and came to the US for three weeks in March 2014.
to work with the host organization on the development of an action plan or methodology to create/develop and apply OER in the foreign fellow’s originating academic institution. Everyone reconvened in Washington D.C. at the end of the U.S.-based program to synthesize and discuss strategies for sustaining the MENA OER network and supporting implementation back in participant home regions. In Phase II a sub-group of the OER practitioners and experts who helped plan the Open Book Project travelled to countries in the Middle East and North Africa region to work with the foreign fellows on implementation of the plans created in Phase I; meet with key stakeholders in academia, government and the NGO community that are already serving or have the potential to serve as local champions for the open educational resources effort; and learn about existing efforts and challenges. I was privileged to be a member of this group and just returned home from site visits to Tunisia, Saudi Arabia, and Qatar. Tunis is home base for the Arab League Educational, Cultural and Scientific Organization (ALECSO). Comprised of 22 member states ALECSO works to coordinate cultural and educational activities in the Arab world. ALECSO is launching a new strategy, aiming to enhance the use of ICT in the areas of Education, Culture and Science through five projects approved by the ALECSO execution Council and the ALECSO General congress. Here I am at ALECSO with my colleagues Mary Lou Forward and James Glapa-Grossklag. (photo by Vladimir Spencer) Our hosts gave us a great overview of their plans. The other four ALECSO projects are worth mentioning as OER could be strategically included in each. An Arab competition (ALECSO Apps Awards) with awards to encourage Arab developers to innovate and create mobile applications and populate the ALECSO App’s store. Develop capacity in the use of Cloud Computing services in education in the Arab region. In addition to these projects ALECSO is hosting an Arab Forum for Scientific Research and Sustainable Development, in Dubai UAE December 19-21, 2014. As part of this event they will be reporting out on and planning future activities related to Arab – International Cooperation. One of these activities deals with Arab-North American cooperation and agreements. They plan to have an Open Book Project panel that engages Arab decision-makers, policy-makers, academics and researchers in advancing this work through planning, objectives setting, components of the project, and defining mechanisms for implementation. Building capacity of Arab teachers/institutions to produce their own OER and building community across countries for exchange of good educational practices, skills, expertise, know-how, etc. Lots going on and heartening to see Creative Commons as a key building block for such a vision. I was in Tunis right before Tunisia’s October 26th elections. There were signs of tension – parts of Av Habib Bourguiba were sectioned off by barbwire fencing and police were a visible force. There were some incidents on the outskirts. But overall on the streets of the city I’d say things are relatively low key with way less in your face political lobbying than we see in N.A. It is heartening to see the successful democratic election that took place being called a “beacon of hope in an uncertain region“, and Tunisia held up as one of the few countries to come out of the Arab spring with a democracy. “It’s sad and worrying that such incidents have reached a land that is very distant from religious or ideological extremism. It is jarring and alarming that this has happened in Canada, of all places. Canada has always been seen as a successful country, minding its own business. It has always been an open, diverse society that has one of the highest levels of immigration in the world. In Riyadh we were hosted by Abdullah Almegren who leads the National Center for e-Learning & Distance Learning at the Ministry of Higher Education. This trip had many cultural components and I feel honoured by the way our hosts shared the history and culture of their region. 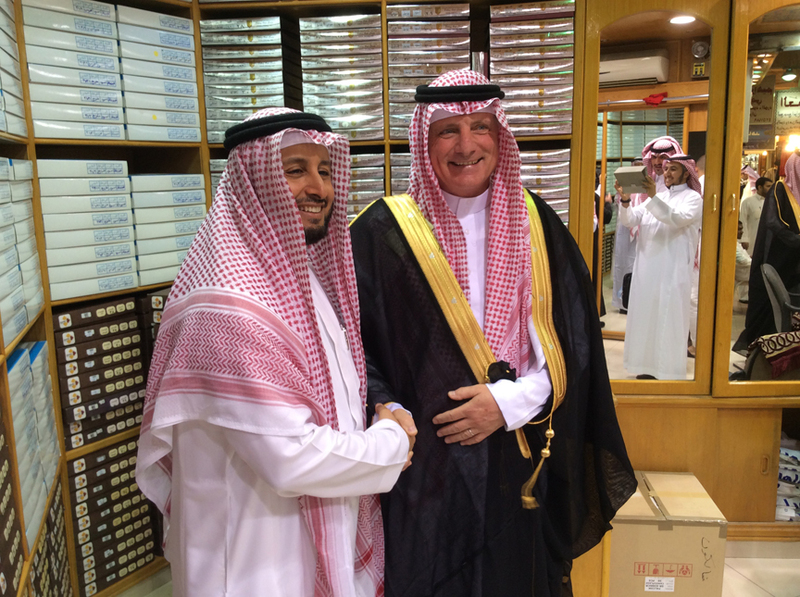 Abdullah and his colleagues took us to old town Riyadh where we were suitably garbed. Here I am with Abdullah. We were given tours of universities – James and I went to King Saud University and Imam Muhammad ibn Saud Islamic University. Mary Lou went to the women’s public university Princess Nora bint Abdul Rahman University. Ministry of Education plans for a Saudi Arabian OER initiative were shared with us and we were asked to conduct a workshop for deans of e-learning from universities across the country. As part of this workshop I agreed to speak on Success Factors for a National OER Initiative. Based on the questions we’d been asked, their planning documents, and my own experience with OER initiatives I decided to put together a one page diagram that represents my take on what a national framework for OER should encompass. This is the first time I’ve tried to consolidate all the various components of a large scale OER initiative into a single diagram. I’ve since added a few additional elements but let me start with a short explanation of this initial version. When it comes to OER I usually get a lot of questions related to technology. However, in this diagram I try and show that there are many components to an OER initiative that have nothing to do with technology and come well before technology decisions need to be made. I start with Strategy. Large scale OER initiatives should be strategic and purposeful. Doing OER without a real purpose is not a recipe for success. The US Department of Labor TAACCCT program is a great example of a national OER initiative with a clear purpose – move displaced and unemployed workers into jobs in high growth industry sectors by funding community colleges to create stacked and latticed credentials in partnership with industry. All the curricula these community colleges create must be licensed with a Creative Commons CC BY license making them OER. In addition to strategy a large OER initiative needs incentives which could be monetary or could be other things related to innovation or transformation of teaching and learning. A national OER framework should include a research component. It is essential to test out the strategy and purpose of any OER initiative and evaluate practices and outcomes on an ongoing basis. Research informs success. I point to a current source of OER research – the OER Research Hub (and in subsequent versions of the diagram have included the OER Knowledge Cloud). To enable large scale success OER require policy. Creative Commons has been aggregating examples of OER policy from around the world into an OER policy registry. In addition UNESCO has authored an excellent OPER policy development template that describes policy as it pertains to intellectual property, copyright, hiring practices, procurement and many other areas of education operation. (in subsequent versions of the diagram I’ve also included the recently launched Open Policy Network – at Cable Green’s suggestion). Forming inter-disciplinary OER teams within an institution made up of faculty, instructional designers, media producers, librarians, and educational technologists. For OER to succeed a team effort is needed and each of these roles has crucial skills and knowledge to contribute. Faculty have the subject matter expertise, instructional designers the ability to design effective teaching and learning structures and activities, media producers can produce rich multimedia, librarians are superb at finding and curating collections, and educational technologists bring essential skills about how best to develop and deliver OER with technology. Forming communities of practice across all the institutions involved in a national OER initiative that bring together people across institutions by domain (such as arts, science, engineering, etc.) and by role (such as faculty, instructional designers, librarians, etc.) All distinct fields of study and members of OER teams like to talk to their peers at other institutions. The challenges tend to be the same and they frequently learn about great resources their peers have found or new practices that are working well. For actual OER content I advocate implementation pursue four distinct efforts. First review existing curricula already developed and in use that could simply be openly licensed and made in to OER. Second identify educational content that is desired and search existing OER to see if anything is available. If it is simply adopt it. Sometimes OER is found but is not a perfect fit. If that is the case why not adapt it – translate, localize, customize, update or improve the educational materials so that the fit works. Thats one of the benefits of OER – you can modify it. Finally, as a last measure, having exhausted the previous three efforts if OER is needed where none exists then go ahead and author it. OER is transforming education by making educational materials visible and available to all. Success is contingent on high quality resources. In higher education research is quality assured through peer review. I believe the same practice is a success factor for OER too. OER should be vetted through a quality review process and peer review. I place technology next well after all those other key success factors have been dealt with. I highlight a few of the key technology components in the diagram – authoring tools, open file formats (so others can modify the resource downstream), creating portable interoperable content that can be exported out of one Learning Management System and uploaded to another, classification schema for OER, and repositories or referatories where OER can be found, previewed, and downloaded. Finally we come to usage. OER are multi-use. They can be used in on campus courses, mixed or blended courses, fully online courses, and MOOCs. OER don’t just have teaching and learning value they are useful as a means of marketing to students (try before you buy), they provide a rich source of supplemental resources for students to use when they are studying, they can help industry meet the professional development needs of their employees, they help working adults pursue career pathways, and they attract national and international interest in your institution. In subsequent versions of this diagram I’ve added accessibility (ensuring OER meet the needs of those less abled) and pedagogy (factoring pedagogical approaches into the design of OER and innovating new open pedagogies based on the unique attributes OER have). All-in-all I’m pleased with this diagram as it captures over ten years of work in the field on a single page. This diagram is generalizable to any large OER initiative. From Riyadh I went to Doha in Qatar for meetings with Qatar National University. The Qatar National University has developed a Technology Enhanced Learning (TEL) Strategy for the years 2014 – 2019. A key objective of the strategy is for the university to embrace, promote, practice and evaluate the “Culture of Open Education”. The plan has been approved but implementation is on hold. Open Book Project support could provide the necessary confidence needed to move forward with implementation. Raise open education awareness and identify new partnerships. The U.S. Department of State, the U.S. Department of Education, and the Office of Science and Technology Policy will jointly host a workshop on challenges and opportunities in open education internationally with stakeholders from academia, industry, and government. The session will foster collaboration among OGP members and other interested governments and will produce best practices to inform good policies in open education. Pilot new models for using open educational resources to support learning. The State Department will conduct three pilots overseas by December 2015 that use open educational resources to support learning in formal and informal learning contexts. The pilots’ results, including best practices, will be made publicly available for interested educators. Launch an online skills academy. The Department of Labor (DOL), with cooperation from the Department of Education, will award $25 million through competitive grants to launch an online skills academy in 2015 that will offer open online courses of study, using technology to create high-quality, free, or low-cost pathways to degrees, certificates, and other employer-recognized credentials. This academy will help students prepare for in-demand careers. Courses will be free for all to access on an open learning platform, although limited costs may be incurred for students seeking college credit that can be counted toward a degree. Leveraging emerging public and private models, the investments will help students earn credentials online through participating accredited institutions, and expand the open access to curriculum designed to speed the time to credit and completion. The online skills academy will also leverage the burgeoning marketplace of free and open-licensed learning resources, including content developed through DOL’s community college grant program, to ensure that workers can get the education and training they need to advance their careers, particularly in key areas of the economy. Inclusion of the MENA region in items 1 and 2 could significantly improve the likelihood of successful OER implementation and advance cultural exchange and understanding. Based on my experience OER affords a cross-cultural education experience and can act as a form of diplomacy, understanding, and peace-keeping. I am deeply indebted to the many people who hosted and helped me on this trip. I really enjoyed the camaraderie with my colleagues Mary Lou Forward, James Glapa-Grossklag and Vladimir Spencer. I was especially touched by the many in country people who shared perspectives and experiences of life in their country. Through OER we share and prosper together. Alhamdulillah.